A judge has ordered to Samsung to explain why it shouldn't be sanctioned for leaking confidential Apple documents. Early last month, Apple requested sanctions against Samsung after it was discovered that company executives were given details of a highly confidential Nokia-Apple patent license. 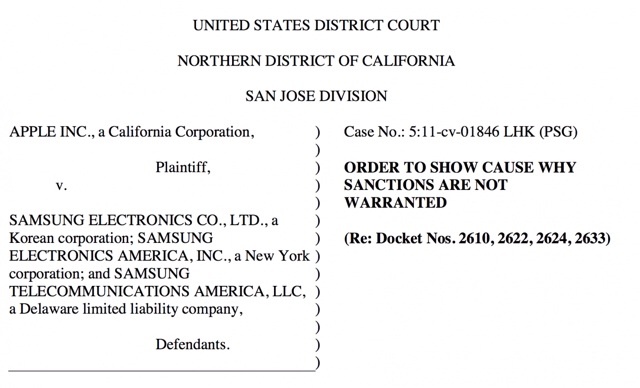 Judge Paul S. Grewal reviewed boxes of Samsung documents and determined, "having finally crawled out from under the boxes, it appears to the undersigned that if anything was breached, it was this court’s protective order, and that sanctions against Samsung and its attorneys are warranted." Samsung and its counsel are invited to file a brief by December 2, 2013 to show cause why sanctions should not issue for these violations. Apple and Nokia also may submit a brief by this same date proposing appropriate sanctions. The parties shall address both the legal framework and the evidence relevant to any sanction to be imposed. All briefs may be up to twenty-five pages in length. The full order can be found below.